Evans Mbugua is an artist-designer born in 1979 in Nairobi, Kenya. He currently lives and works in Paris, France. Both of these culturally diverse cities are an inspiration for his works. Mbugua comes from a graphic design background, having majored in Print Design. This training is visibly demonstrated in his artistic technique. His work is a creative medley of colour and print detail captured in portraiture. For Mbugua, design and art form the perfect symbiosis -- they are "in sync". He does not merely utilise prints to enhance his portraits; he also reinterprets prints - through a fresh depiction of a modern sign or symbol - to create an unusual dazzling design. Creating a layered effect, the print forms a backdrop and a portrait is positioned in the foreground. Each portrait is composed of a unique series of small-dot effects on the glass or perspex - his mediums of choice. Discussing his artistic practice Mbugua says: "I portray my life, and those of my friends and strangers. In this way, diversity nourishes my curiosity about the world. I look at our identities and their hidden facets, and my portraits celebrate the characters of my subjects. I use glass and perspex to beautifymy subjects through the glow and reflections they emit, while underlining human frailty. In my work, pictograms represent our urban environment, which shape and provide the rhythm of our lives, and in turn, become my playground." 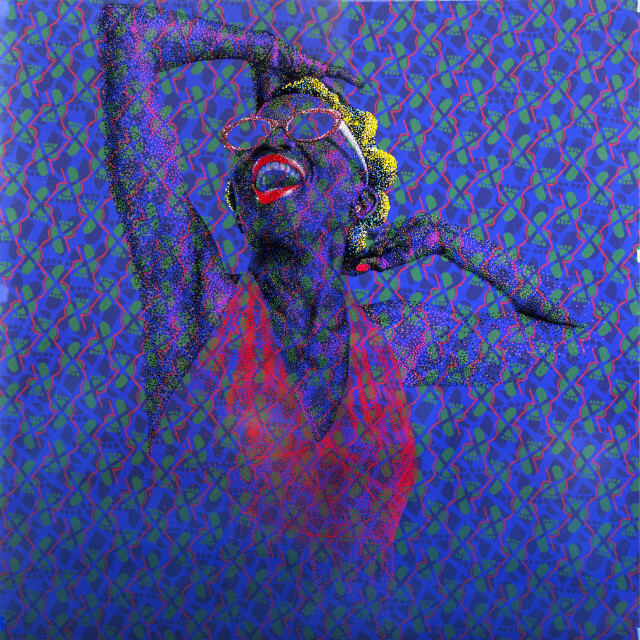 Mbugua's works are held in institutions and private collections in France, the UK, Italy, the United States, Denmark, Nigeria, Morocco, and Kenya. He has featured in exhibitions in Paris, London and New York.